In his curatorial debut, Swiss artist Valentin Carron, who represented Switzerland at the 2013 Venice Biennale, presents “Work Hard,” a compact and compelling overview of contemporary Swiss art (see Venice Biennale Curator Okwui Enwezor On “All the World’s Futures”). The show’s title refers to the fabled Swiss work ethic, as well as to a graffiti scrawl Carronsaw on a public sculpture in Lausanne. This particular story of recent Swiss art trends is told from a very specific point of view, a kind of eccentric, neo-Dada vision that reflects Carron’s own quirky sculptures and installations. Visitors circulate through the exhibition in custom-designed rooms lined with silver walls, echoing Warhol’s “factory.” The show contains engaging works by Ugo Rondinone, Urs Luthi, Fabrice Gygi, and others. 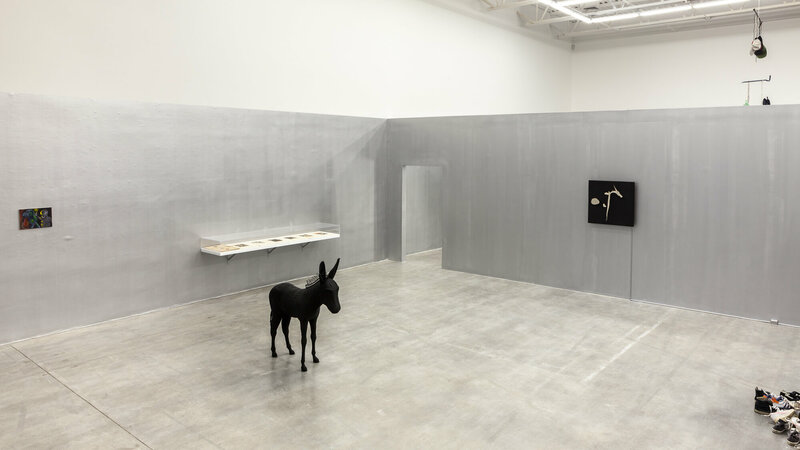 A black-painted plywood and rattan donkey, Black Balthazar, by Mai-Thu Perret, makes for an intriguing show opener, positioned at the exhibition’s entryway near one of Claudia Comte’s small Arp-like modernist wood sculptures placed on a low shelf. A motorized black-and-white wall relief by Jean Tinguely, hung on the rear wall of this room, is just one of several historical pieces, including works by Daniel Spoerri, Luciano Castelli, and Meret Oppenheim, that Carron has selected in homage to his artistic forebears.